Alaska commercial fishing jobs include employment opportunities onboard oceangoing vessels, as well as jobs closer to shore. If you are looking for seasonal work that is as challenging as it is lucrative, you may want to consider investigating this work option further. Crew positions on fishing boats don't open up often, and available jobs are often given to people the captain or boat owner knows. You may be able to find a job by visiting the docks before the fishing season starts to approach boat captains directly. If your goal is to work on a floater, which is a floating fish processing vessel, the Anchorage Mid-Town Job Center has information about employment opportunities and job fairs which you can request by e-mail. It also has a toll-free job hotline number you can call to find out out openings. Commercial fishing vessels range in size from 20-300 feet in length. The smaller boats stay closer to shore, but large fishing vessels may be operating up to 200 miles out at sea. During the summer fishing and processing season, most of the boats operate relatively close to shore and are fishing for salmon and herring. Before you decide to apply for a job in this industry, you need to be aware that working on a commercial fishing boat in Alaska is one of the most dangerous occupations that you can be involved in. The waters off the Alaskan coast are cold and can be treacherous. The possibility of having to navigate through storms and using the nets and equipment makes the boat a work environment that can be very hazardous. If an accident occurs, expert medical attention is not likely to be readily available. Depending on where the boat is located and the weather conditions when the incident happens, it could be at least several hours before you could be transported to a hospital. Before accepting a contract to work on a commercial fishing vessel, be sure to ask about what safety equipment is on board and familiarize yourself with the safety rules. A person who wants to work on board a boat must have a current commercial fishing license. Each crew member is responsible for obtaining this document, which is available from the Alaska Department of Fish and Game. The boat owner is responsible for providing other safety equipment, such as survival suits, for all crew members. Another choice available for people looking for Alaska commercial fishing job is to consider getting a position on board a floating fish processing vessel. These boats are known as "floaters" in the industry. The floaters take fish from fishers and get it ready for market. 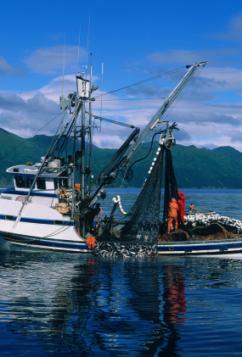 Alaska commercial fishing jobs are not for people who are hesitant about rolling up their sleeves and getting to work. You must be prepared to work long hours, in wet and cold conditions. There may be little to no privacy while working on the boat, and the ability to get along well with others is an important attribute. During the height of the commercial fishing season, workers must be prepared to work as long as it takes to get the job done. Long hours are the norm, and the grueling schedule is a test of the workers' endurance. People who get jobs on floaters are usually paid an hourly wage for their work. Finding an Alaska fishing boat job does require some patience. Start your search early and be sure to reach out directly to boat captains in addition to applying for jobs via the resources provided above. Exploring different position options is a great way to begin your journey on an exciting career.